You can help our team of surgeons provide much needed medical attention by improving the health and mobility of women living in underserved communities worldwide. Although some supplies are donated and team members are all volunteers, every other aspect of these trips is only possible through generous donations. Please make your donation to WOGO via one of the following methods. Your donation is 100% tax deductible. Download the Donation Form and email to info@wogo.org or mail to the address below. 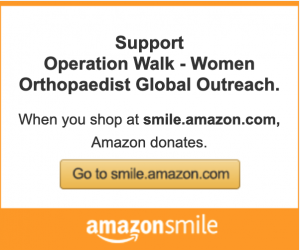 Checks should be made out to Women Orthopaedist Global Outreach. No donation is too small and your compassion will make a significant difference. WOGO spends very little money on administrative overhead and almost all of your donation goes directly to patient care. Each WOGO outreach trip represents an immense logistical undertaking. On average, 9,000 pounds of supplies (such as implants, surgical equipment, medications, etc.) must be shipped ahead to the host country and cleared through customs before the trip can even begin. Medical supplies are welcome; anything from extra bandages to walkers, canes and crutches can help us provide care for those less fortunate. Additionally, airline miles and ways to defray shipping costs are also welcomed. Please contact us if you are interested in donating supplies! Where in the World will WOGO go? WOGO is a Finalist in the ShareCare Awards – You can VOTE! © 2019 WOGO. All Rights Reserved.